Real estate tycoon Donald Trump was sued Saturday by New York Attorney General Eric Schneiderman for $40 million. The lawsuit claims The Apprentice star helped run “Trump University,” a phony program that promised riches and apprenticeships in real estate but never delivered. Instead, what it did deliver was useless seminars that came with a Trump-size price tag, costing students up to $35,000. Schneiderman said students didn’t even get to meet Trump but got their picture taken in front of a life-size picture of him. Students were worse off financially after they studied with instructors who were “hand-picked” by Trump because of the high costs of the seminars. They would take the initial three-day program then were told they needed more instruction to be successful. If they signed up for “Trump Elite,” they would get individualized coaching until they made their first real estate deal. That one-on-one instruction came with a price between $10,000 to $35,000. When students tried to cancel their memberships, the program wouldn’t do so in a timely manner. The $40 million will serve as restitution. Another case of a crook hustling the fools who believe in his ideology. Trump’s regurgitation of ancient Republican slogans haloed by idiot box presentations of his crap reality TV show brought in the suckers like ants to spilled sugar. As soon as they realized they were being snookered, they tried to get their money back – to no avail. This con artist kept every penny he could steal. It’s easy for some to say they got what they paid for. But, the core of the fraud remains unethical and close to criminal. Trump lied to get people to pay for something they never received. Hopefully, he will now get some of what he deserves. 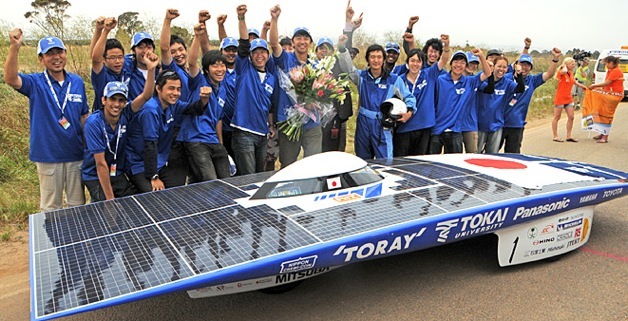 According to the provisional results…seven teams managed to go the entire 2,998 kilometer but Tokai came out on top because their average speed – 91.54 kilometers an hour – was faster than any other finisher. The Tokai’s final time was 32 hours and 45 minutes. The fact that only seven teams finished out of a starting list of 37 shows that this is not an easy race, and this year was particularly difficult thanks to brush fires (set by arsonists) along the route. We have kin who have worked their butts off for similar competitions in North America – and especially appreciate the effort not only by the designers and teams; but, everyone who works to produce the competition. Moulshri Mohan was an excellent student at one of the top private high schools in New Delhi. When she applied to colleges, she received scholarship offers of $20,000 from Dartmouth and $15,000 from Smith. Her pile of acceptance letters would have made any ambitious teenager smile: Cornell, Bryn Mawr, Duke, Wesleyan, Barnard and the University of Virginia. Indians are now the second-largest foreign student population in America, after the Chinese, with almost 105,000 students in the United States in the 2009-10 academic year, the last for which comprehensive figures were available. Student visa applications from India increased 20 percent in the past year, according to the American Embassy here. RTFA. A multipliplex of incompetence, political foolishness, unwillingness to see beyond your nose. India and the United States maintain differing allocations to the concept of an intellectual elite. The easier transition from country to country in an educational culture becoming globalized helps students otherwise marginalized, denied by inequity. But, responsibility still remains unanswered in both India and the United States. Young people capable of learning, acquiring skills and knowledge, of contributing to the betterment of society lose the opportunity. The barriers in either nation may differ. The result is the same. When Jacob Barnett first learned about the Schrödinger equation for quantum mechanics, he could hardly contain himself. For three straight days, his little brain buzzed with mathematical functions. From within his 12-year-old, mildly autistic mind, there gradually flowed long strings of pluses, minuses, funky letters and upside-down triangles — a tapestry of complicated symbols that few can understand. Elementary school couldn’t keep Jacob interested. And courses at IUPUI have only served to awaken a sleeping giant. Just a few weeks shy of his 13th birthday, Jake, as he’s often called, is starting to move beyond the level of what his professors can teach. In fact, his work is so strong and his ideas so original that he’s being courted by a top-notch East Coast research center. IUPUI is interested in him moving from the classroom into a funded researcher’s position. This is not what Jake’s parents expected from a child whose first few years were spent in silence. “Oh my gosh, when he was 2, my fear was that he would never be in our world at all,” said Kristine Barnett, 36, Jake’s mother. RTFA. A delight. Not just for the tale of young Jacob; but, how his parents adapted and learned, experimented with freeing his latent abilities – sometimes regardless of the directions suggested by professional help more inclined to find the right box to put him into. Great family story from all sides. And a young person I look forward to seeing in a larger picture someday. In the old days it didn’t matter so much which journal research was published in. Now it counts for everything. Funding bodies now award grants almost exclusively to researchers who have published in a handful of top scientific journals. According to Peter Lawrence, an emeritus professor at the University of Cambridge, it’s this new accounting mentality that is “corrupting” the scientific process. Professor Lawrence, who used to edit a scientific journal, and is a respected researcher himself, says “it’s a bit like judging a hospital by how quickly the telephone is answered. What counts now is how often the research is cited, or mentioned, by other researchers in their publications, he says. This is supposed to be a reflection of how influential a piece of research has been. But many outside the grant awarding system regard it as a crude measure. The priority now for many career scientists is to market themselves in a way that maximises their ability to have their research published in the top journals. They spend time travelling to scientific meetings to network with colleagues who may be reviewing their work. The research itself can at times seem a secondary concern. The only way out of this cycle of “corruption”, according to Peter Lawrence, is for grant agencies to move away from counting citations and to actually read research proposals and to judge their quality. Kind of seems obvious doesn’t it. Of course, that might require staff at some of the journals deeply immersed in prestige – instead of leadership in investigation – to put in quality time off the networking circuit. People who spend a lot of time browsing the Internet are more likely to show depressive symptoms, according to the first large-scale study of its kind in the West by University of Leeds psychologists. These ‘internet addicts‘ spent proportionately more time browsing sexually gratifying websites, online gaming sites and online communities. They also had a higher incidence of moderate to severe depression than non-addicted users. “Our research indicates that excessive internet use is associated with depression, but what we don’t know is which comes first — are depressed people drawn to the internet or does the internet cause depression? Which shows how much concern I feel over chicken v. egg studies like this. A team of researchers working at the MR-Center of the University Children’s Hospital in Zürich has completed a pilot study using transcranial MR-guided focused ultrasound to treat 10 patients with neuropathic pain. The origin of chronic pain in these patients included post amputation phantom limb syndrome, nerve injury, stroke, trigeminal neuralgia and post herpetic neuralgia from shingles. Any time you don’t have to poke holes in this carcass of ours is a good time. I have a bit more confidence in ultrasound used for this procedure rather than focussed radiation. A Japanese university is giving away Apple’s trendy iPhone to students for free, but with a catch: the device will be used to check their attendance. The project, which is being tested ahead of its formal launch in June, involves 550 first and second year students and some staff of a department at Aoyama Gakuin University, which is located just outside Tokyo in Sagamihara city. The school’s iPhones are meant to create a mobile information network between students and professors, but they are also a convenient way for the teachers to take attendance in class. As students enter the room, instead of writing their name on a sheet, they simply type in their ID number and a specific class number into an iPhone application. “Up until now, we’ve been using little slips of paper to take attendance. But with a cell phone, you don’t have to spend time collecting all of those and so I think it’s quite nice,” 20-year-old student Yuki Maruya. Bet the App Store gets some use, too. Researchers at the University of Illinois have developed a membrane-penetrating nanoneedle for the targeted delivery of one or more molecules into the cytoplasm or the nucleus of living cells. In addition to ferrying tiny amounts of cargo, the nanoneedle can also be used as an electrochemical probe and as an optical biosensor. “Nanoneedle-based delivery is a powerful new tool for studying biological processes and biophysical properties at the molecular level inside living cells,” said Min-Feng Yu, an associate professor of mechanical science and engineering and corresponding author of a paper accepted for publication in Nano Letters. Wow! As screwed-up as our education system is at the grassroots level, at least the realm of higher studies remains sufficiently advanced to attract the best and brightest. If we could only figure out how to carry this obvious capacity down to our high schools and all undergraduate institutions.